Situated on the Gulf of Finland and spread over numerous islands in the Neva Delta, St Petersburg is a city of arched bridges, winding canals, wide boulevards, elegant palaces, impressive squares and ornate churches, and as such is often referred to as the 'Venice of the North'. It has an elegance also reminiscent of cities like Paris, Berlin and Amsterdam, but is at the same time too uniquely Russian to be European, and beguiles with a charm all its own. 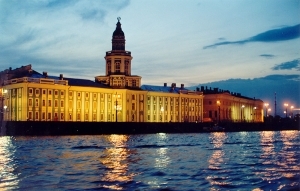 It is the country's most beloved and beautiful city, founded by Peter the Great in 1703. It became the capital of Tsarist Russia, and the greatest artists, sculptors and architects worked together to create the city's elegant look. Rich palaces and government buildings line the streets, along with majestic cathedrals and elaborate churches, including the golden spires of St Peter and Paul's Cathedral, the magnificent gleaming dome and grand colonnaded façade of St Isaac's, and the colourful multi-domed Church of the Resurrection. Although the Russian capital moved to Moscow after the Revolution, St Petersburg remains the principal artistic and cultural centre of the country. St Petersburg is the birthplace of Russian ballet and performances by the Kirov Ballet, rivalling the Bolshoi ballet in Moscow, are shown in the historic Mariinsky Theatre. The magnificent green and white Winter Palace forms part of the Hermitage Museum, one of the world's greatest art galleries, and the city's foremost attraction. With its romantic waterways and decorative Tsarist architecture, St Petersburg is also the perfect setting for the famous 'White Nights', and the summer months of June and July are crowded with visitors who come to experience the dreamy twilight that takes the place of night.